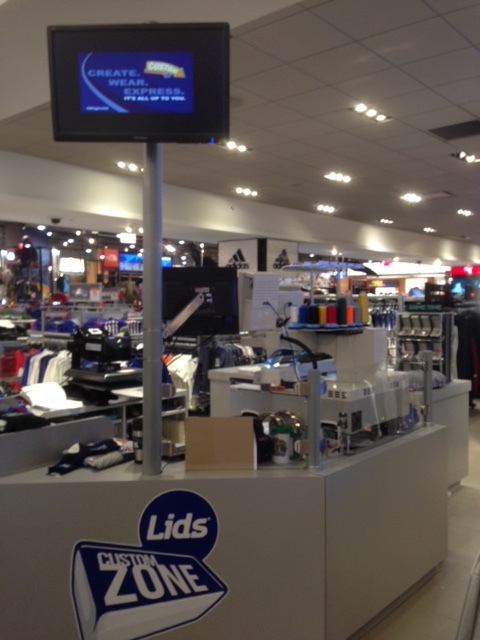 The New York teams shop in the Macy’s flagship store in Herald Square, which appears to be a Lids shop-in-shop, has installed instant embroidering and heat transfer machines at the register for personalizing caps (mostly New Era Yankees), t-shirts (Reebok and Nike), and jerseys (Majestic). A salesman even offered to embroider the cap I was wearing. Embroidery adds about $10 to the cost of the item (most of the merchandise was 15%-25% off), with an extra $1-$2 each for additional designs such as stars. The salesman said most of the people going for personalization are tourists, and estimated that 65%-70% of those customers add a name to the items they purchase.